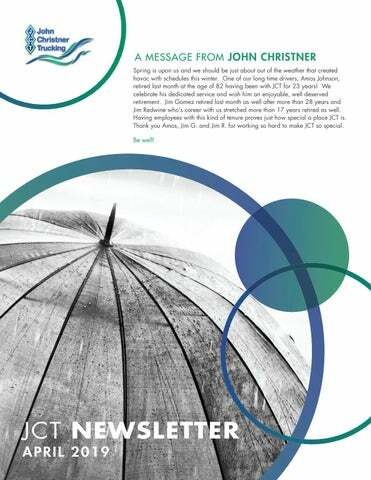 A MESSAGE FROM JOHN CHRISTNER Spring is upon us and we should be just about out of the weather that created havoc with schedules this winter. One of our long time drivers, Amos Johnson, retired last month at the age of 82 having been with JCT for 23 years! We celebrate his dedicated service and wish him an enjoyable, well deserved retirement. Jim Gomez retired last month as well after more than 28 years and Jim Redwine whoâ&#x20AC;&#x2122;s career with us stretched more than 17 years retired as well. Having employees with this kind of tenure proves just how special a place JCT is. Thank you Amos, Jim G. and Jim R. for working so hard to make JCT so special. Be well! Rebecca Dobson nominates John Wayne Christner for the April “Whatever It Takes” award Rebecca said, “Since his arrival I have noticed John Wayne’s upbeat attitude. He comes in and says hello to everybody regardless of their position within the company. He has reached out by phone to drivers introducing himself and having genuine conversations. I have personally witnessed him taking the time to talk to drivers in person for at least an hour. He has been through each department learning what each position does. His friendly, upbeat attitude is infectious and has improved overall morale within the company: across all departments. These attributes assist in making both drivers and on-site employees feel appreciated and valued.” John Wayne will be honored with a trophy, a “Whatever It Takes” designated parking space in front of the building, and a $50 QuikTrip gas card. He will also have the honor of naming next month’s “Whatever It Takes” winner. J I M AN D J IM , Y O U ’ L L BE M ISSE D.
Shop Supervisor and Shop Foreman doing a hard day’s work of clearing ice off a loaded trailer. H AVE A H APPY RE TIR E ME NT, AM OS J OHNSON! Three Million Mile Cletus Zundell Charli Brown said, “Cletis James Zudel has been with JCT for almost 20 years; since 8/27/99. Currently he is our lead local driver for area 2 consisting of Oregon, Washington, and Idaho. He recently received his 3 Million Miles Safety Award from the Oklahoma Trucking Association. He currently has over 5 million miles with no accidents in his carreer. He has 3 children: Rayleyne, Donovan and Kandi. He has 3 granddaughters: Makenzie, Ellie, and Zoey James. His advise to other drivers: pick up on time and deliver on time and you will be sucessful at JCT. He also said to keep ziplock bags on your truck. Everytime you swap put the bills in the plastic bag for the next driver so they don’t get wet and/or oily. He lives in Washington and loves spending time with his family. In the summer, they love going to the lake for family get-togethers which include his mom and his 100 year old grandmother. JCT’s Parke Whitney, 2019 Oklahoma Driver of the Year, was praised with a standing ovation. Truck Day at the Capitol is an annual event that helps get professional drivers in the legislature office. This year Million Mile and Professional Driver recipients met at the Capitol to be recognized by both the House and Senate. Before heading to the House gallery, everyone enjoyed a breakfast together. These drivers were referred to as “The Voice of Trucking”. Those attending Truck Day at the Capitol on March 7th were Tracy Ross, Parke and Cindy Whitney, Walter Behringer, Billy Weimer, and Billy Wrenn. Realignments, new additions & PRomotions Blake Thomas- VP of Logistics Blake learned transportation with a publicly traded 3PL, then had a stint in the software industry. He joined JCT in 2018 and immediately made key contributions to improving execution and results in logistics. He’s also taken on sales and account development responsibilities for JCTL. Jim Gomez Sr- Jim started his career in trucking over (50) years ago and retired in March as VP of Operations after (28) years at JCT. Jim was fiercely loyal to his employer’s brand and was an integral part of our success. His leadership and presence set a tone of integrity and commitment that will live on for years to come at JCT. Lynn Lemon- Lynn worked in the transportation industry for over (50) years and spent (23) years at JCT. Starting in sales, Lynn is credited with introducing JCT to one of its largest and best customers, Tyson Foods. Lynn then moved into the billing department in 2009. He is retiring in the Spring. Jim Redwine - Jim learned about transportation in the US Army and after (20) years with numerous companies he came home to JCT in 2001. Jim lived in DFW and sold Texas for (18) years before retiring March 12th. No one loved their customers more, or was more loved by their customers than Jimmy Redwine. We appreciate his years of service, and his contributions help insure our ongoing success. Cory Manzi- VP of Brokerage Operations Cory spent 18 years with a large 3PL and gladly moved back to his home town of Ft. Worth TX to join JCTL in May 2018. His industry knowledge and team building skills are essential to leading a team of over (20) associates in our rapidly expanding logistics division. Cory is also involved in key account management and bid processes for JCTL. Brian Ford- VP of Driver Management Brian had over (8) years trucking experience when he was recruited to JCT by Marty Means in 2005. Brian load planned multiple areas before taking on the Driver Manager department in 2014, which now includes over (15) associates managing close to (800) drivers 24/7/365. Connie Sperry – VP of Business Development Connie worked at JCT as a load planner (12) years ago before relocating to the DFW area and pursuing a sales position with a large LTL carrier. She returned to JCT in 2018. Her cross-trained background and familiarity with the JCT model and personnel has already produced results and made Jim Redwine’s retirement a seamless transition with several large incumbent accounts. Greg Gorman- EVP of Sales & Marketing Greg gained exposure to the 3PL and trucking world through his father Dennis, who was Warehouse Manager at a large glass plant. After working for two other trucking companies Greg joined JCT (15) years ago, and currently manages sales, relationships and service with many of JCT’s most important accounts, including Wal-Mart, and helped develop our logistics division as well. He recently relocated back to New England area to be closer to family & friends. Scott Bryan – Corporate Trainer Scott had several years of prior trucking experience, worked in real estate and most recently in the ministry with a local church. His unique skill set has made an immediate impact at JCTU where he developed and implemented driver personality assessment and engagement training programs for all employees. Q1 retention results are trending 50% above 2018 results and Scott’s training has had a direct impact on that positive trend. Marty Means- EVP of Customer Service Marty had (13) years experience in the trucking industry when he joined JCT in 2000. Marty has successfully developed accounts, talent, service and culture at JCT and is one of the most respected and trusted executives at JCT. His sister-in-law’s not a bad singer either. Virgil McPherson- VP of Loss Prevention Virgil started in the trucking business in 1975 and joined JCT as a dispatcher (30) years ago. He’s been a key contact with Tyson for over (15) years and now takes on oversight of OS&D, claims mitigation and incident resolution for the company. Quiet and steady, Virgil’s years of experience are an asset to JCT and it’s customers. Trish Boone- VP of Compliance Trish joined JCT in 2010 after a (16) year stint at a large flatbed carrier. Swearing off family-owned trucking companies she took a chance on JCT and are we ever thankful she did. No one is better at maintaining compliance with our customers and training our associates at JCTU. Dustin Byrd- VP of Account Management Dustin spent several years in the large 3PL space before joining JCT in 2011. He helped found the Ft Worth location and his presence and leadership have been key to the stability of that office. He also oversees daily customer-facing responsibilities with several large JCTL accounts. Jim Gomez Jr- VP of Planning Following in his father’s footsteps Jim Jr. started at JCT in 1996. Working as a load planner, then a production and velocity specialist he is now leading our entire Load Planning department. He also has a steady demeanor and rock solid integrity like his Dad. Jacob Lliteras- Account Manager Jake joined JCT at the ripe old age of 23 as Marketing Manager in the Driver Recruiting Department. After two successful years here, he left JCT to pursue a family business opportunity outside of trucking. Jake rejoined JCT in Jan 2019 (in the Ops Department this time), and is being trained as an Account Manager. Welcome back to the JCT family Jake! Jeremy Fields- VP of Operations The newbie in the field, Jeremy joined JCT only (8) years ago with no trucking specific experience, but has risen quickly to a key position. His knack for analysis and approachable demeanor combined with his (6) years as a load planner qualify him to help lead our Operations Department for years to come. John Wayne Christner - Driver Liaison John spent the last 4 years in the Denver area working in sales for a company that supplied single serving health & beauty items to convenience channels, as well as optical wear to discount retailers. Having grown up around JCT and worked a summer in the shop years ago, he had some preexisting exposure to the brand. His energy and enthusiastic approach to help solve driver related issues is already producing positive outcomes in one of the most challenging areas facing OTR trucking today- driver retention. 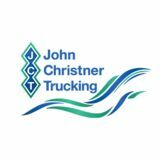 FOR THE THIRD TIME IN THE LAST FOUR YEARS, John Christner Trucking has been recognized by Walmart with their Temperature Controlled Carrier of the Year Award! Walmart told Mr. Christner that we stood out by, “executing on-time delivery, collaborating on new best practices and providing solutions to an everchanging supply chain.” In a press statement they said that JCT has, “provided Walmart with innovative and improved service offerings that ultimately help us lower our cost to our customers and stay in stock.” For 30 years, JCT’s ability to provide excellent transportation service has meshed well with Walmart’s goal to provide American communities with fresh produce. In a Tulsa World article concerning the same topic, Danny Christner explained, “Being on time and providing good service never goes out of style. It’s a tool and a strategic advantage, especially with temperature-controlled freight.” Let’s make 2019 another great year marked by hard work, thoughtful problem solving, and commitment to excellence! Stay sharp and keep up the good work everyone! MOLECULE FOUND INSIDE OUR CELLS COULD BE THE MOST IMPORTANT MOLECULE OF ALL! Glutathione, the body’s master detoxifier and main antioxidant, protects our cells and optimizes our energy metabolism. Here are 5 foods rich with Glutathione: 1. 2. 3. 4. 5. Broccoli -- why does this one seem to always make our lists?? Asparagus -- grilled this summer is scrumptious Avocado -- super food Walnuts -- ALA source for brain health as well Watermelon -- super powerful antioxidant fruit *Coach Jeff is not a physician and does not give medical advice only information not to be taken as medical advice. See Dr. Mark Hyman for medical advice. 1.Heat oven to 375° F. Unroll dough; separate into 8 triangles. Place in ungreased 9-inch square pan or 10-inch pie plate; press over bottom and up sides to form crust. 2. In 10-inch skillet, cook beef over medium heat 8 to 10 minutes, stirring occasionally, until thoroughly cooked; drain. Stir in salsa and taco seasoning mix; simmer 5 minutes. Spoon meat mixture in crust-lined pan; sprinkle with cheese. 3. Bake 14 to 17 minutes or until crust is deep golden brown and cheese is melted. Served topped with lettuce and tomato, if desired. Amy Cason’s son, JC, showing at Creek County on March 2nd. He placed 3rd with his pig, Tank. Candace Sisk with her husband, Matthew, and sons, Seth and Corbyn Sisk. Spring break 2019, her first time seeing real snow in Pagosa Springs, Colorado. Kami Green’s son, Blake, went to Checotah to a big money race on March 2nd in his winged kart and won. His winnings are going toward the mini stock he is building to race at Creek County Speedway this summer (Mom’s a little nervous about this). Kristy Reece’s girls, niece, and nephew (Molly, Gabby, Audrey, and Rylan) enjoying a hike at Turkey Mountain over spring break. Danny Christner and Kregg Wood of Bar-S Foods watching the Texas Tech Red Raiders move on. They’re in the Final Four for first time ever! Lucy Hobb’s cat, Dash, lounging in the sink. Tiffany Todd’s kids, Tj and Tayla, doing some spring break fishing. Diane Scott’s dogs, Gibson and Bubba, relaxing. Brooke Johnson’s daughter, Karleigh, warming up for her spring pictures. Leon loves playing dress up at lunch. Shaila Montgomery’s brother, Cody, and first niece, Lorelai. On the left is Amy Cason’s granddaughter, Tinlee. On the right is her other granddaughter, Teagan, going to her first daddy-daughter dance. Turner Rosson (Tara’s son), and JD Smoot (Betty Smoot’s Grandson) First T-Ball Practice! Shaila Montgomery found out that her sister is having a boy! C O NTACT I N FORMAT I ON Mailing Address: P.O. Box 1900 Sapulpa, OK 74067 19007 W. Hwy. 33 Sapulpa, OK 74066 BCBSOK BCBSOK 800-672-2567 TrueNorth Driver Insurance 800-877-9637 ATBS/American Truck Business Services 888-640-4829 or www.atbs.com Driver Legal Driver’s Legal Plan 800-417-3552 JCT Wellness Jeff Ravenscroft 918-857-8600 Zurich OCC/ACC 866-280-4390 Reach out to JCT employees on Facebook, Twitter, phone, mail, or fax. Any correction or input for next month’s newsletter is welcomed and appreciated. Please send to strk@johnchristner.com by Wednesday, April 24th.